Births to illegal alien mothers are adding more to the U.S. population each year than did immigration from all sources in an average year prior to 1965. FAIR estimates there are currently between 287,000 and 363,000 children born to illegal aliens each year. This figure is based on the crude birth rate of the total foreign-born population (33 births per 1000) and official estimates of the size of the illegal alien population – between 8.7 and 11 million. It should be noted that the Bear Stearns investment firm and others have concluded that the actual number of illegal aliens in the United States could be as high as 20 million.2,3 Using this higher number would roughly double FAIR’s estimate to approximately 574,000 to 726,000 children born to illegal aliens each year! As of 2001, the cost of having a baby in the U.S. ranged from $6,000 to $8,000 for a normal delivery and $10,000 to $12,000 for a cesarean birth (to as much as $14,000 in certain parts of the country).10 Assuming that an average birth in the year 2007 now costs $8,000, the total cost for 363,000 anchor babies would be approximately $3 billion. Assuming the more realistic number of 726,000 anchor babies, the total cost would be nearly $6 billion. American taxpayers pay a substantial part of this cost. In 1994, California paid for 74,987 deliveries to illegal alien mothers, at a total cost of $215.2 million (an average of $2,842 per delivery). Illegal alien mothers accounted for 36 percent of all Medi-Cal funded births in California that year.1 A survey conducted under the auspices of the University of California, found that of new Hispanic mothers in California border hospitals, 15 percent had crossed the border specifically to give birth. Two-thirds of births in Los Angeles County hospitals are to illegal alien mothers who are in the U.S. in violation of our existing immigration laws. Illegal aliens are not eligible for welfare benefits, but their citizen children qualify for Aid to Families with Dependent Children (AFDC) and other benefits granted to US citizens. Based on data collected in California for AFDC’s “children only” cases, the California Department of Social Services estimated that in fiscal 1994-1995, 193,800 children of illegal aliens received welfare, costing $553 million. By not addressing this abuse of the Fourteenth Amendment and enforcing immigration law, the funds that state and local governments must provide to anchor babies amounts to a virtual tax on U.S. citizens to subsidize illegal aliens. By deliberately not addressing this loophole, Congress in effect rewards law-breakers and punishes those who have chosen to follow the rules and immigrate legally. The 14th Amendment stipulates that Congress has the power to enforce its provisions by enactment of legislation, and the power to enforce a law is necessarily accompanied by the authority to interpret that law. Therefore, an act of Congress stating its interpretation of the 14th Amendment, as not to include the offspring of illegal aliens, would fall within Congress’s prerogative. Congressional district reapportionment weighted by the presence of illegal alien noncitizens is notably unfair to American citizens (both natural-born and naturalized), and clearly violates the principle of “one man, one vote”. As the number of US House seats is fixed at 435, reapportionment means that if a given state gains a House district, another state must lose one. If non-citizens (illegal aliens) are counted in the decennial Census upon which districts are apportioned, then states with larger illegal alien populations are likely to end up with more districts and therefore more representation in the House. This effectively dilutes the votes citizens in states having relatively low proportions of illegal aliens. The Mexican government recently provided dual nationality to its citizens who naturalize in the United States. No longer looked upon by their countrymen with contempt, those who emigrate (and sneak in) to the United States are seen by Mexico as advocates for its presumed territorial claims to the American Southwest. Mass immigration, while acting as an overpopulation safety valve for Mexico, simultaneously strengthens Mexico’s political presence inside the United States. Mexican dual nationality serves to retain the allegiance of its citizens who become United States citizens, and to discourage assimilation – in spite of the oath of allegiance they take to America. Unconstrained illegal immigration and disregard for the rule of law are not conducive toward maintaining US sovereignty. Special corporate and political interests want all the cheap foreign labor they can get. Misinterpreting the 14th Amendment and granting automatic birthright citizenship to children of illegal aliens is but one aspect of the dismantling of America. In April, 2005, President Bush signed the Security Prosperity Partnership with Canada and Mexico, with the stated objective of ensuring the free movement of goods and people across the US border. This treaty, never ratified by Congress, is a significant step towards the North American Union where a sovereign United States will be merely a memory. The United States is past the point of environmental sustainability. Scientists have noted that a sustainable population at today’s consumption levels would be approximately 100 to 150 million people.6 A good and readable overview of the population-environment connection can be found at SUSPS. A visual presentation of the damage illegal immigration does to the environment near our southern border can be seen at DesertInvasion.US. The United Kingdom, for example, formerly allowed Birthright citizenship. In 1981, because of immigration pressures, they restricted it to now require that one parent be a legal resident. In France birthright citizenship has been changed — now children between the ages of 16 and 22 of illegal alien parents must actively seek French citizenship. Millions of Americans have served in defense of the United States of America. Many have died to preserve the freedoms that we take for granted – freedoms granted to United States citizens by the US Constitution. Granting birthright citizenship to the children of illegal aliens whose first act in coming here is to break our laws, cheapens beyond recognition the meaning of our Constitution and the value of the lives lost fighting to preserve it. Quite simply, the Fourteenth Amendment currently is being interpreted to grant automatic birthright citizenship to children born in the United States of illegal alien parents (called anchor babies because under the 1965 immigration Act, they act as an anchor that pulls the illegal alien mother and eventually a host of other relatives into permanent U.S. residency). This clearly is contrary to the original intent of Congress and the States in ratifying the Fourteenth Amendment. While it has been the practice to bestow citizenship to children of illegal aliens, this has never been ruled on by the Supreme Court. I have written how free, purely private education was the American way, and it worked. I mentioned how this was the norm up until at least the 1830s and really even beyond. I ended with the question, “Why did it change?” How was this high level of freedom and individual responsibility lost? How did a once-completely-free aspect of life come to be dominated by government mandates and taxation—that is, government confiscation of private property? I mentioned how some claim that changes in society necessitated reform of education. For some reason or other, upswings in technology, mechanization, the industrial revolution, and a few other things allegedly changed the face of society so drastically that the only way to bring the masses of common people up to speed was for government to intervene, begin to confiscate and redistribute wealth with which to provide public schools. Does this argument have any basis in fact? Only to a very limited extent. The truth involves much more than that. First, the rival religion. This was the influence of Unitarianism, particularly through New England congregational churches, and mainly by the work of Unitarian activists. These individuals had abandoned many traditional Christian doctrines, and instead promoted the ideals that mankind could be perfected through proper education and training; they believed in the essential divinity of mankind; they believed that this divinity of man was most pronounced when mankind is considered collectively as a whole; so, therefore, they believed that the civil State was the highest expression of divinity on earth; and thus, they believed, that the State was the ultimate parent and benefactor of individuals. Perhaps the most important of these types was the so-called father of public schools in America, Horace Mann. Mann, a Congregationalist minister, believed very strongly in the positions just stated, and more. Mann argued that human rights derive from Nature; and this Nature—with a capital “N”—he interpreted, “proves an *absolute right* to an education of every human being that comes into the world.” This is the classic “entitlement mentality” which has characterized leftism, communism, socialism, etc., before and since, which today is often applied to health care, employment, etc.—here Horace Mann applied it very early to education, by which he meant public education. Unitarian activists, such as Horace Mann, were ready and willing to employ government force in order to remake society according to their mandates and by their means—in fact, government force was the name of the game. Some of the guys in this movement were fiercely radical with this belief. In the mid-1850s, the radical revolutionary John Brown committed several acts of violence and murder in Kansas and in Virginia intending to start a slave rebellion that he thought would eventually bring about abolition. The underlying belief was that it is legitimate to use violent revolution to impose better social values. Shortly before his death by hanging, Brown himself made this point explicitly: he said he was “quite certain that the crimes of this guilty land will never be purged away but with blood,” and that this would never be done without “very much bloodshed.” He was a terrorist, born and bred on American soil, and carried out acts of terrorism on American soil, in the name of social and political change for the better. Now Brown himself had studied in Massachusetts to be a Congregationalist minister, but quit due to financial and health problems. But he established radical connections there that would help finance his later acts. The least publicized aspect of Brown is this: his six main financiers who propagandized his work for him back in New England were all six Unitarian Congregational ministers. And while not every one of these types believed in open revolutionary violence like Brown, nevertheless they all believed in using the force of government to bring about the social changes they thought desirable (which is really not much different if you consider it—it’s comparing one version of unwelcomed coercion for another, and in both cases, imposed by someone who thinks they know better than you, and who believes they have the right and authority to impose their view on you by force). The successive generations of men, taken collectively, constitute one great commonwealth. The property of this commonwealth is pledged for the education of all its youth, up to such a point as will save them from poverty and vice, and perhaps to prepare them for the adequate performance of their social and civil duties. The successful holders of this property are trustees, bound to the faithful execution of their trust by the most sacred obligations; and embezzlement and pillage from children and descendants have not less criminality . . . than the same offenses when perpetrated against contemporaries. No one man, nor any one generation of men, has any such title to, or ownership in these ingredients and substantials of all wealth, that his right is invaded when a portion of them is taken for the benefit of posterity. In other words, we’re going to tax you for education, and you’ll pay the tax and shut up, because you have no right to complain about it. It’s not really your property to begin with, and what we’re doing is for you own good and the good of posterity. Make this note: public schooling from day one was incapable of existing without socialism. It requires by definition the government to claim ownership over at least a portion of every individual’s property. This was constantly sold to the public as something for their own good. Thaddeus Stevens used this very argument to defend Pennsylvania’s public schooling law of 1834 in the legislature the following year. To those who objected that it was morally wrong to tax some people to pay for other people’s education, he responded, “It is for their own benefit, inasmuch as it perpetuates the government and ensures the due administration of the laws under which they live, and by which their lives and property are protected.” See, the paternal state knows what is best for you, and what is the best use of your money, and besides, such measures “perpetuate the government” that knows all this! Who could be against that? The common school is the greatest discovery ever made by man. . . . Other social organizations are curative and remedial; this is a preventative and an antidote; they come to heal diseases and wounds; this to make the physical and moral frame invulnerable to them. Let the common school be expanded to its capabilities, let it be worked with the efficiency with which it is susceptible, and nine-tenths of the crimes in the penal code would become obsolete; the long catalogue of human ills would be abridged; men would walk more safely by day; every pillow would be more inviolable by night; property, life and character held by a stronger tenure; all rational hopes respecting the future brightened. This is language of healing and of hope. This is the language of religion, and Mann wanted it funded by the State. The scholar who studied the history of the state-takeover of education noted what action step Mann really had in mind here. It was the same thing public schools have said ever since: “give us the money and we can do it; our failure thus far is your fault in that we have received insufficient funds.” And of course, Mann like most public school advocates ever since believed that the school and its parent State had a right, an entitlement, to appropriate those funds from private people. Overrun by such Unitarian thought, Massachusetts was the first state to create a State Board of Education in 1837. As its first chairman, they placed Horace Mann. Of interest was the timing of the creation of this secular board: up until 1832, the Congregational Church was an established church in that state—receiving funding from the state to pay her ministers, etc. That was abolished in 1832 (Massachusetts was the last state to do so), and the state-funded education program was in place in only five years. And in that same year 1837, Mann brokered a political deal that immediately doubled the budget for public education. Common schools were already being funded in Massachusetts by local taxes, but this was the first centralizing of it by the State. The astute observer will note what many public school critics to date have pointed out—the established churches were kicked out and the public schools were made the de facto state-church in their place, but were now officially a secularized state-church, and the tyranny was doubled in the amount of money appropriated for it. Of course, this state-controlled system was the antithesis of the free and private system which had existed and served America just fine for over two centuries to this point. Russell new this, and nevertheless saw the change as progress. Before as we mentioned previously, teachers had to compete with each other—and this bred greater choice, improved quality, lowered costs, etc. But socialists like Russell demeaned this system by saying “the teacher was a chattel sold on the open market”; instead he praised “The teacher as a civil servant whose foremost duty is the promotion of the welfare of the State.” He did get one thing right when he called this scheme “a new conception in American life.” It certainly was: not only was the civil State never meant to be a factor in education in the original American way, but the very conception and practice of civil coercion was a rejection of basic American freedoms: freedoms in traditional religion, property, business, and family—all of which had to be overturned and/or replaced in order to impose the grand scheme of State-supported and State-controlled education. Indeed, it was nothing less than a secularized replacement of the established church. There was at least one religious group that saw what was going on, and they within just a few years began starting their own private schools as an alternative. This was the Roman Catholic Church, and the rise of Catholic parochial schools coincided with the rise of secularized Unitarian public schools from which they would become havens. More importantly, this became viable for them financially due to the second major factor, mass immigration. Much of this immigration came from Irish Catholics who fled the Irish potato famine beginning in 1845. In 1825, there were only about 5,000 Irish in Boston. In 1845, the number had multiplied six times to 30,000, and they now made up about 30% of the population. These saw the imposition of government schooling as a secularized version of what was formerly Protestantism, so they started their own schools. This was true of most of the other early immigrant groups, most of whom came from Northern Europe, and were either Lutheran or Dutch Reformed. All of these groups started private schools so as to avoid the secularized indoctrination of the public school system, and these denominations still have these traditions today. But many of the Americans, particularly the Unitarian minded-civil religion types, hated Catholicism, and saw immigrants as a threat, so they tried to use the force of government to impose their version of American culture on these people. To them, public school was not only a means to perfect mankind and cure society of all ills, it was a means of turning immigrants into “good Americans.” And over time, the secularized religious motive fell further into the background, and the promotion of Americanism became the thrust of public schooling. Of course, the America these establishments promoted was already a long way from the America that had once been free. Throughout this whole process, many orthodox Protestants accepted the façade of Christianity in the Unitarian-driven school system, and thus the idea was always accepted that “our” public schools are Christian. But they were so only on the surface—and that for deceptive purposes only. Immigration not only caused cultural and religious tensions, but also created economic tensions as the labor market was flooded with hundreds of thousands of new people. Of course, with the industrial revolution gathering steam in the 1830s and forward, the waves of immigrants provided a source of very cheap labor. But factories and large business owners quickly learned what type of temperament and mentality was best suited for the tasks of factory labor—someone who was accustomed to repetition, schedules, monotony, quiet obedience, single file lines, etc. And these wealthy influences in society quickly learned they could steer public education to produce such workers. So the third factor in the loss of liberty in education was the rise of big business, corporations, and particularly the influence of industrialization and factory mechanization. Not only does this pertain to the loss of liberty, but more importantly to the normalization of a life in which that liberty was gone. The mass production of public education became the tool by which America grew adapted to life without freedom in education, in which the question was never even raised. Now here is where the issue of modernization and industrial revolution come in; and like I said, there is some truth (albeit very limited) to this phenomenon requiring changes in society. But here is the important qualification: the phenomenon itself did not require political changes for education, but rather big business found it profitable to ally with big government and leverage government power—just as the Unitarian ideologues had done for their agenda—in order to start mass-producing workers to meet the demand for factory labor. Soon, the schools mass-produced workers in the same way the factories mass-produced widgets. Most of you, indeed, cannot but have been part and parcel of one of those huge, mechanical, educational machines, or mills, as they might more properly be called. They are, I believe, peculiar to our own time and country, and are so organized as to combine as nearly as possible the principal characteristics of the cotton-mill and the railroad with those of the model state’s prison. The school committee is the board of directors; while the superintendent — the chief executive officer — sits in his central office with the timetable, which he calls a programme, before him, by which one hour twice a week is allotted to this study, and half an hour three times a week to that, and twenty hours a term to a third; and at such a time one class will be at this point and the other class at that, the whole moving with military precision to a given destination at a specified date. He can at any given moment tell you exactly where any squad, or class as he would term it, is, and what it ought, at least, to be then doing. Mechanical methods could not be carried further. The organization is perfect. The machine works almost with the precision of clock-work. It is, however, company front all the time. From one point of view children are regarded as automatons; from another, as india-rubber bags; from a third, as so much raw material. They must move in step and exactly alike; they must receive the same mental nutriment in equal quantities and at fixed times: — assimilation is wholly immaterial, but the motions must be gone through with. Finally, as raw material, they are emptied in at the primaries and marched out at the grammar grades; — and it is well! And he should have added, after graduation, corralled directly into the industrialized workforce; because, he had been trained for the past several years, to live a lifestyle of boring tasks, from one whistle blowing to the next. Horace man had been interested in education for the perfectibility of man. The industrialists couldn’t care less about perfectibility, they only cared about the trainability of man. And that legacy of public schooling has been with us ever since. There is, by the way, much truth in Adams’ comparison of the public schools to not only mills and railroads, but the state prison. The same Unitarian reforming spirit that gave us the institution of public schools also produced, in the same era, the penitentiary, the insane asylum, and the poorhouse. All of these were built on the same theory that society was the bed of corruption, and the proper way to train people was to put them into a controlled atmosphere in which the allegedly corrupt external influences could not affect them; and this very popular theory was applied to the reform of criminals, the insane, the mentally ill, the poor, and to the education of children. So in the same decades of the 1820s–30s, this nation witnessed the explosion of official institutions for all of these issues, and the growing prevalence of using taxation and government control for these institutions. And yet, as decades went on, and it became clear that the theory was bogus, that no genuine reform was made in criminals or the insane, and that corporate interests came to dominate the schools—in short, that the whole system was a failure—the officials merely continued to blame failure on the lack of funds and/or greater control. This was true so much so that one of the few historians of the Asylum phenomenon concluded of its legacy, “Failure and persistence went hand in hand.” Yet at the same time, when correctional institutions failed, advocates shifted their emphasis from “cure” to “prevention”—and thus, education instead of penal or remedial institutions. This was used, then, as an argument for greater government involvement and support of education. Yet finally, as sort of a capstone upon these three major factors, Americans began to abandon home and private education due to the illusion that government schools were free. This creates different levels of motivation. Some buy the illusion completely: the school costs them nothing while it educates their children and simultaneously provides free child care during the day. This illusion is swallowed most readily by people who don’t own property, and thus never directly see a property tax appropriated from them personally. And since property tax is usually escrowed automatically, even most property owners don’t really feel the true weight of it anyway. Other people merely live content with the illusion, knowing it actually costs money, knowing they actually pay taxes to support it even if indirectly through increased rents, yet accepting this as moral or at least practical enough to live with. These people, too, once receiving the benefits, will defend the system which taxes other people to benefit them. Even among public officials who know better, the phrase is simply modified to remain deceptive: public education is free, “at the point of delivery” (which is, of course, an admission that it’s not free). This all works together to make the perceived benefit of “free” education a powerful motivation among those who are dependent upon the system; they remain self-interested in perpetuating a system that confiscates property from some people and gives it to others. In short, once dependent, they become advocates. Yet the system, used and defended by so many conservatives and Christians, is based on an anti-Christian, socialistic system of values at its very core. It has more in common with Nazism than with anything that can be called a Christian society. So how was liberty lost in the area of education? It was through anti-Christian ideology leveraging state power to impose a state-funded, state-controlled utopia. They established a whole new secular state church in the name of getting rid of state churches. It was through mass immigration that among other things sparked misguided Protestants to use government power to oppose Catholicism and turn Europeans into Americans. It was through the rise of industrialization and mechanization that used mass-production in education to create dutiful, reliable masses of workers for mass-production in factories. And it was through the vastly accepted myth that public schools are free, and the fact that we have now grown vastly dependent upon the benefit. These things, all combined together, created a very powerful culture in which freedom in education is gone economically (we’re all forced to pay for public schools even if we don’t use them), and was almost lost practically, except in small enclaves, until the past few decades. But the one aspect in which it is still largely free is legally: you still can exercise the freedom if you choose. Many Christians and others are realizing the need to reclaim our freedom in education; many are already practicing it as much as they can; and the tools and resources to make it viable, effective, and easy are today so vast and easy to find that there is no good excuse for anyone who loves liberty not to pursue it. As I have already said repeatedly, this is the one area you can change drastically toward the cause of freedom right now. Nothing toward that cause will be easier, more effective, and more life-transforming for all involved, than restoring freedom for yourself and family in the area of education. And in the next article, I’ll tell you what to do, how to do it, and talk about the sacrifices it will take. Doreen Hannes provided a particularly troubling view of the control of our food supply by the Federal Government and the United Nations. It is a great segue to the Agenda 21 speaker, Ray Cunio, that will speak on 4/17/12 at our monthly Third Tuesday Tea Time. And, only 2% of Americans are engaged in Agriculture. Doreen provided some information to be distributed at the 3/24/12 event, but the e-mail go mixed up somewhere in ‘the cloud’. I remind you again, that a great place to stay ahead-of-the-news on what’s coming down the pike for legislation is the CBO (www.cbo.gov). Add yourself to their e-mail list! I repeat. Add yourself to their e-mail list! 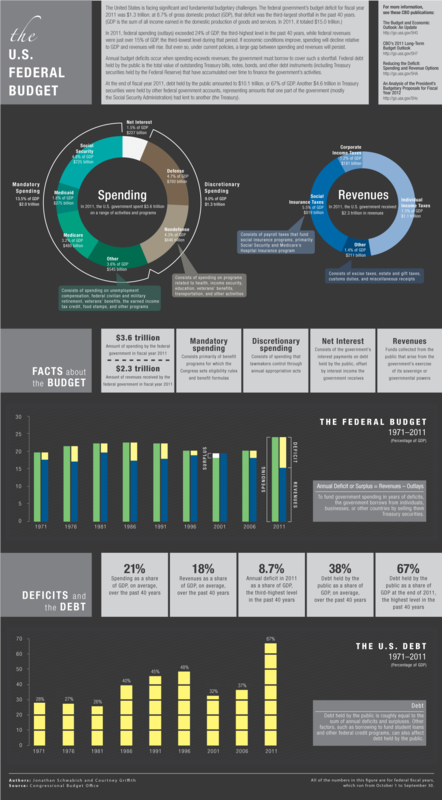 Today’s release included an Infographic on The Budget, Spending, and Debt. The graph at the bottom of the Infographic may be accurate, but it belies the truth that the Federal Government is $15 Trillion in Debt. The GDP is $15 Trillion. So, the Federal Debt is 100% of the GDP! The Federal Debt is 100% of the GDP! Below is a summary of the spending side of the Infographic. Click on the image to display the entire Infographic.